Just last week Johnny Eames announced the signing of six new youngsters, Super Fly Joe Stevens, Super Bantams Paul Quinn and Andy Gatenby, Light Welter Tommy Martin, Middleweight Festim Lama and Light Heavy Onder Ozgu , to his TRAD TKO Boxing Gym squad. Today Johnny announces that Heavyweights Damien Campbell and Paulius Kasiulevicius, as well as Light Middleweight Tommy Williams, have also signed to his famous East London fight factory team. Kilburn’s Damien had an excellent Amateur career, culminating in his reaching the final of the ABAs twice, losing to two of the sports brightest stars David Price in 2005 and Tyson Fury in 2008. Damien turned pro in 2010, winning his first fight, by a shutout 40-36 points margin, against Lee Swaby at the Doncaster Dome in July of the same year. He was back in action in October, this time securing a 38-38 points draw with Colin Kenna at the Troxy in London. Following this fight Damien had a forced sabbatical from the sport, due to an eye problem, and only returned to training a couple of months ago once receiving the all clear. Like his British compatriot, Lithuanian Paulius also had a first class Amateur career, and also made the finals of his National Amateur competition twice, however Paulius went one better than Damien on both occasions to be crowned double Lithuanian National Heavyweight Champion. On making the announcement a beaming Johnny said. “Two more big signings, and big being the appropriate word. 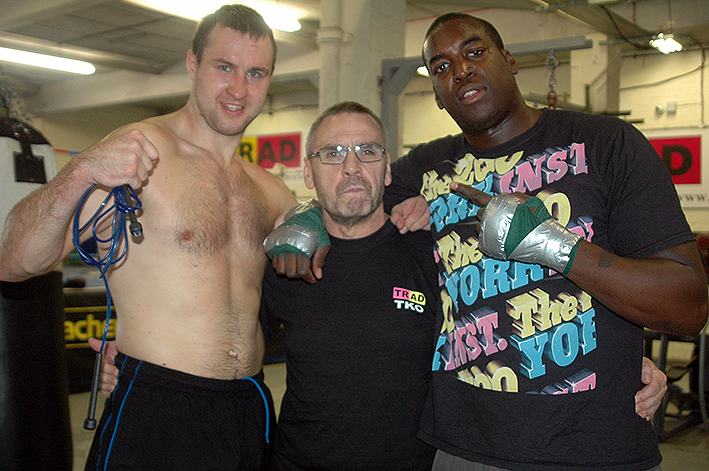 First is Paulius Kasiulevicius, double Lithuanian Heavyweight Champion, 22 years of age. He’s been with us a couple of weeks now, looks like he can really fight and being just twenty two, and with a lot of experience, there’s more than half a chance we can do something big with him. The other is Damien Campbell, double ABA finalist, beaten by David Price and Tyson Fury, there’s no disgrace in that. Getting on a bit now, Damien’s 37, so probably have to be fast tracked. He had to take a couple of years out with an eye problem, but has an all clear now from the board (BBBofC) and is ready to go. Damien has been up here a couple of years really, was with Bryan Lawrence, but since he’s come back he’s made the switch to the TRAD TKO, and yeah we’re looking forward to seeing him back in action. 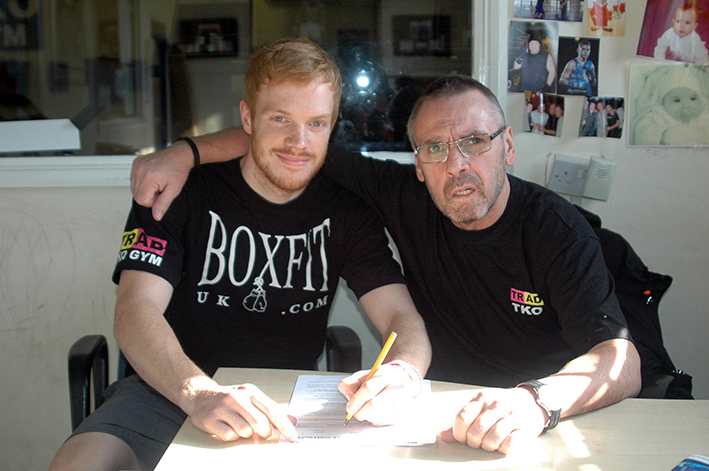 The other kid we’ve just signed is Tommy ‘The Albino’ Williams, Light Middleweight, ginger as you like, ugly as you like, certainly wont lose any looks, that’s for definite. He’s a good friend of Danny Connor, which cuts no ice here. Johnny then changed tack, away from the fighters, to talk briefly on one of the projects he and the TRAD TKO team have been developing over the past months. “It’s exciting times here at the TRAD TKO, not just with the new signings but also with the other projects we have been working on. This year already we’ve added an Amateur Boxing Club, TRAD TKO ABC and TKO Educational, which helps troubled youngsters from the area. Within the next couple of weeks there is going to be a major, major announcement from us in the office, myself and Rio (TRAD TKO publicist Gianluca Di Caro) concerning our promotional outfit - TKO Events International – which will be breaking water, so to speak, in early 2013. Hence the reason we’re trying to sign a big group of fighters to fill our shows, not necessarily for the top of the bill, although if we get fighters who can top the bill, then they’ll top the bill. As it stands at the moment though, we’ll probably bring in top fighters to head up the bill and fill the undercard with fighters from the gym.